1/14/13: My first picture of 2013. I managed to catch Cara performing a very giggly retelling of Snow White. 1/18/13: I took this with my phone, just as I got home with him on the evening of his birthday (it was a Friday). 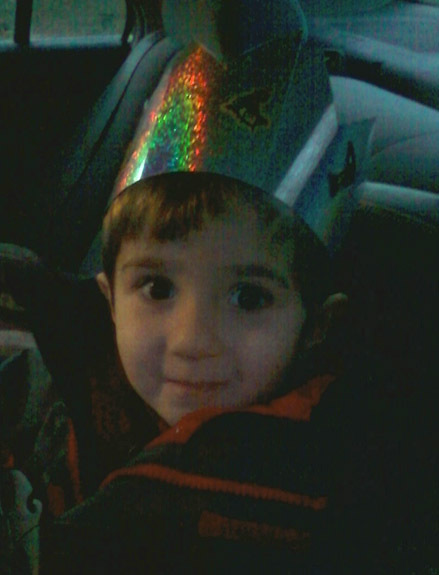 He was so happy wearing his crown! 1/19/13, the day of the party. Snacking in the bay window. The giant Spider-Man balloon Evie ordered for the party. He was very popular. Oh no! He got Grandmama! The playroom, with train table now removed, had plenty of floor space for castles and playsets. This is also a good shot of the "streamer curtain" in the doorway. Evidence of recent "heroing up." Uncle Jim posing with Spider-Man. Owen happily hugs his new shirt. 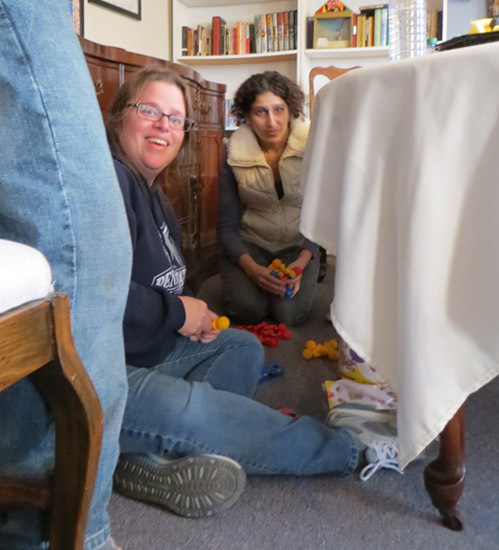 Em and Claire check out one of the new toys under the table. They eventually attracted the older children, and Cara built an impressive "guy" out of the pieces. A nice shot of the super hero cookies. Evelyn knows someone who made these based on a sheet of images I gave her. They came out great! Cake time! We had super hero cookies for the kids but we needed a grown-up cake to stick candles in. Owen having just blown out all three of his candles by himself (for the first time ever)! The choosing of the cookies proved painstaking. This may not be placed correctly from a chronological standpoint. But at some point in the midst of the party, Owen decided he wanted me to read him a book. He went to the shelves and picked out a low-reading-level adaptation of Disney's Tangled. So I read him a princess book at his birthday party. After the party, I snapped a photo of Owen's dessert plate. He carefully arranged it with three cookies and many pieces of fruit. Then he nibbled one bit of the Hawkman cookie, left the rest untouched, and spent the rest of dessert plucking all the blueberries directly out of the fruit salad container and eating those. A sampling of the leftover super hero cookies.